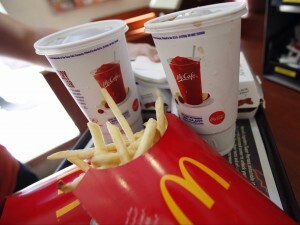 McDonald’s Corp posted a drop in its worldwide sales at comparable stores that were less than had been expected during May, as European sales were able to offset a drop in the U.S.
Shares at the biggest burger chain in the world by revenue were up 0.5% during early morning trading on Monday. The May report is the second to last monthly report on sales from McDonald’s, which is going to start making only quarterly reports of same stores sales starting in July. CEO Steve Easterbrook said that in May quarterly sales would be the better measure for performance than monthly. A large number of retailers in the U.S. stopped reporting same-store monthly sales including Starbucks, Target and Walmart. McDonald’s same store sales were lower by 0.3% globally during May the 12th consecutive monthly decline. Analysts polled expected that the decline globally would be 0.9%. Sales were up by 2.3% in May for Europe, led by better sales in Germany, France and the UK. Analysts were expecting an increase in Europe of 0.6%. Sales at restaurants in the U.S. open for more than 12 months dropped by 2.2% during May, the fourth consecutive month they declined. The U.S. is the top region at McDonald’s for profit. Analysts were expecting sale at same stores to fall by 1.7% across the U.S. The company announced it was attempting a new menu for a limited time and less expensive menu options within the U.S., where it has tried to fight and claw to win back its customers who have opted for fresher and healthier foods. Sales for its Asia Pacific, Africa and Middle East regions were down by 3.2%, which was less than what analysts had predicted of 3.8%. Shares of McDonald’s closed on Friday at $95.53 on the NYSE and are down over 6.7% for the last 12 months.